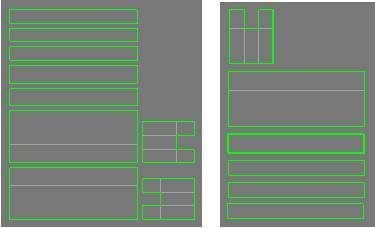 The purpose of unwrapping, is to lay out the surface areas of the model, and then export it as a bitmap. 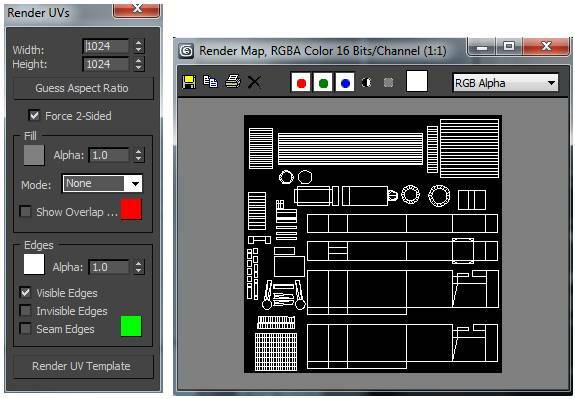 It will become the Template in your paint program that with help you build texture maps for your model. 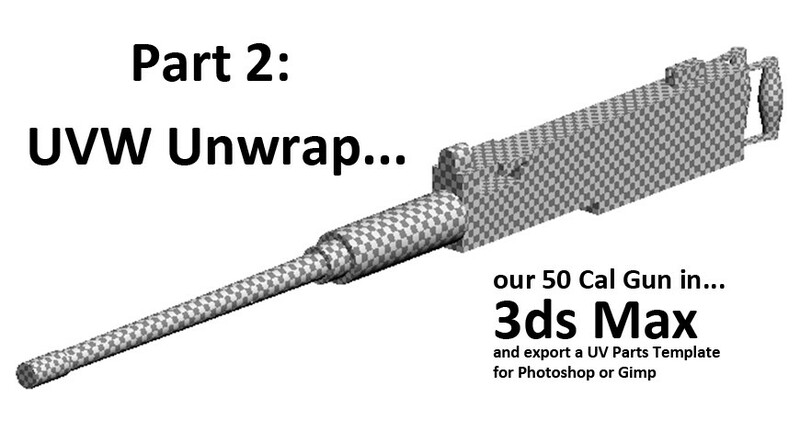 But first we have to lay out the surface areas with a modifier called an Unwrap UVW modifier. Add an Unwrap UVW modifier from the Modifier List. Go to Face mode. Under Selection Parameters uncheckIgnore Backfacing. Then click the Edit button. The Edit UVWs window opens. 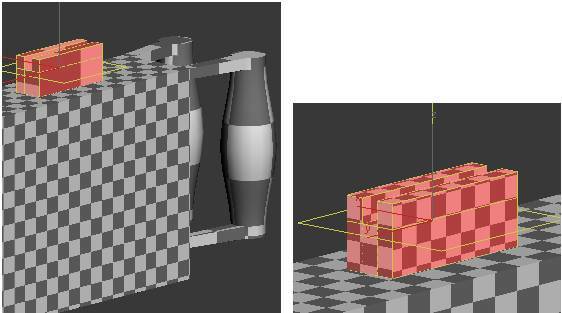 All the surface parts of the model are all jumbled together in the checkered square. Add a Checker pattern from drop down list. 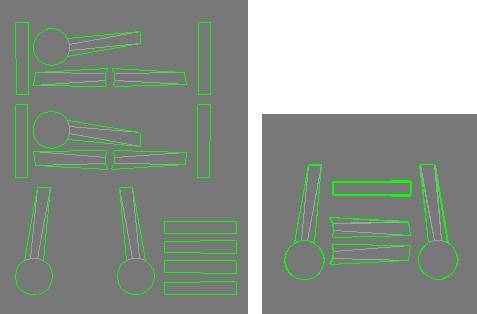 We have to map all the surface areas of the gun, so the checkers are all square and evenly sized. Select all the poly’s of the last barrel segment. Click the Cylindrical button and then Align Y. 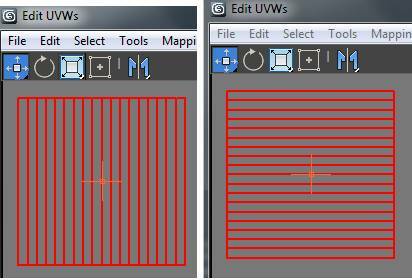 The surface is unrolled in the Edit UVWs window. Un-click the Cylindrical button. Click the Move button in the Edit UVWs window. 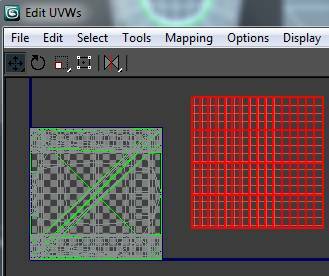 Move the mesh outside the checkered box. Toggle the Angle Snap on the toolbar. Rotate the mesh. We will line up all barrel segments to be horizontal, pointing to the left. 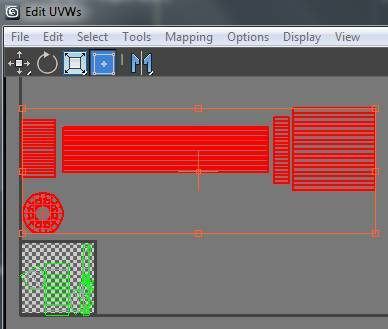 Check the Edges in Edit UVWs window to see which way to rotate. #1. Group select the next barrel segment poly’s. #2. 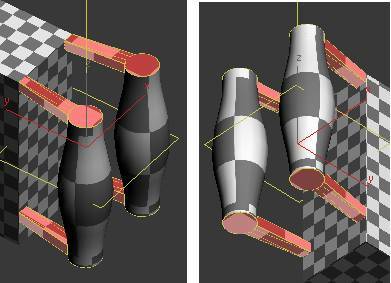 Click Cylindrical button and then Align Y. #3. Move the mesh outside the checkered box. #4. Rotate the mesh . #5. 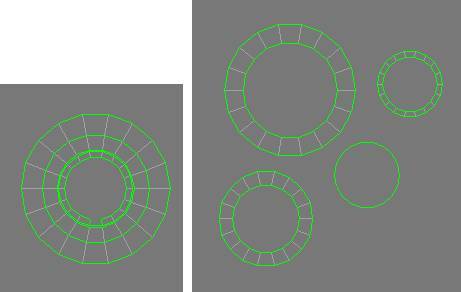 Place each barrel segment in proper order. Ok, the purpose of the checkers is to make them square and the same size on all barrel segments. This is important to maintain the same size pixels from the texture bitmap on all barrel segments. Or else one segment could have bigger pixels than other segments. Or even worse is to leave one barrel segment with rectangular checkers, which would stretch the pixels from the texture. 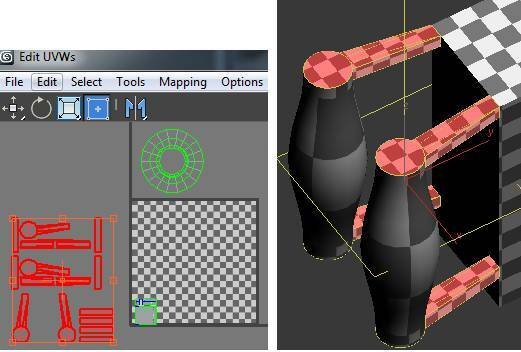 Use the Freeform mode to resize each segment until the checkers are square and the same size on each barrel segment. Make sure you are in Face mode, and Select Element is checked. Select all the rest of the barrels poly’s. There are 5 flat segment areas of the barrel left. 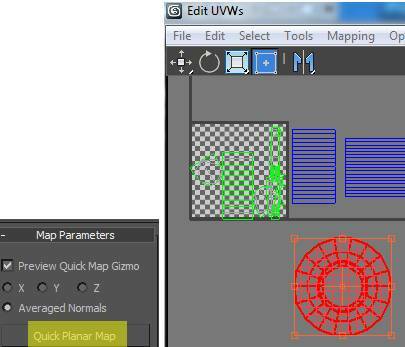 With the poly’s still selected, under Map Parameters click Quick Planar Map button. Use Move to move the selections outside the box. Click the Scale button in the Edit UVWs window. 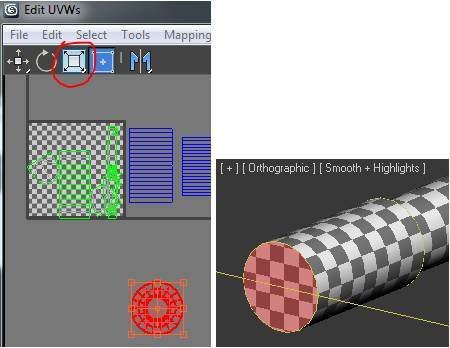 Scale down the poly selections until the checkers are about the same size as the barrel segments checkers. Group select all of the barrel parts, and put it in an empty spot above the checkered box. Select the gun box poly’s shown below. In the Edit UVW’s window on the menu go to Mapping/Normal/Box Mapping. Move the gun box sides to an empty space. 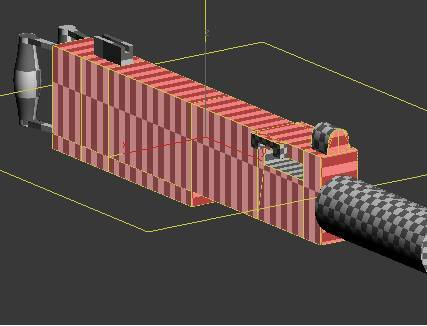 Scale the gun box mesh until the checkered squares are the same as the barrel. Select the ammo hatch cavity poly’s. Go to Normal Mapping/Box Mapping. Move the selection outside the checkered box. Scale it up so the checkers are even with the rest of the model. Select the hatch handle poly’s. Go to Normal Mapping/Flatten Mapping. Move the selection outside the checkered box. Scale it up so the checkers are even with the rest of the model. Group select the front gun sight poly’s yet to be mapped. 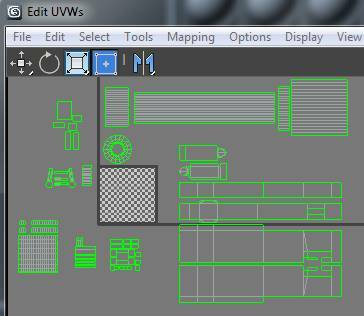 In the Edit UVWs window, on the menu, go to Mapping/Normal Mapping. Choose Box Mapping. Click OK.
Move the selections outside the checkered box. Scale down the selection to make the squares of the front sight are even with the other squares. 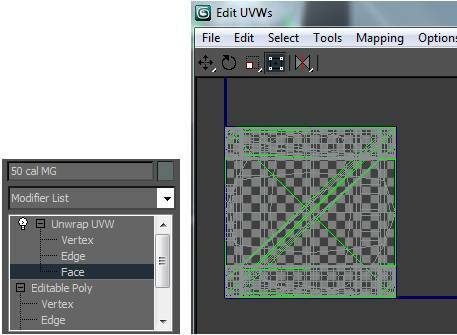 In the Edit UVW’s window, use the Move and Rotate tools to line up the three top and side meshes. Go to Edge mode and click the edges to be Stitched. Click the Stitch button This is so we don’t have visible seams in the texture when applied to the model. Group select the rear gun sight poly’s. Go to Normal Mapping/Flatten Mapping. Move the selection outside the checkered box. 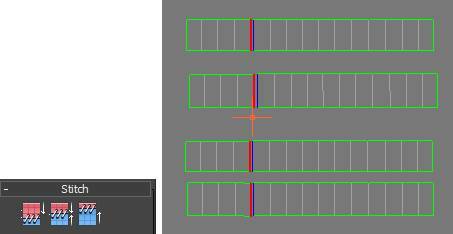 Use the Move tool to overlap any pieces that are the same dimensions. Move the selection outside the checkered box and Scale it to even the checkers. Many of these poly’s can be overlapped. Use the Move, Rotate, Mirror Horizontal/Vertical, to evenly overlap the same pieces. Select the left poly’s below. 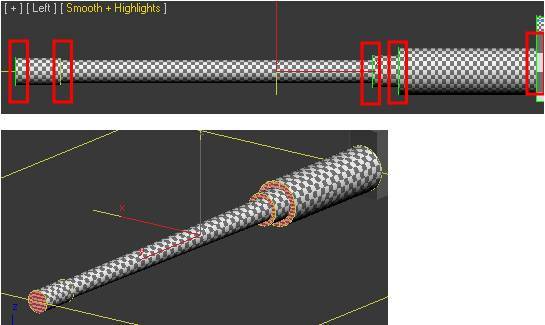 Go to Cylindrical mapping on the Z axis. Scale and move the mesh outside the box. Do the same for the other handle. Line up the short ends, so we can Stitch the pieces together. 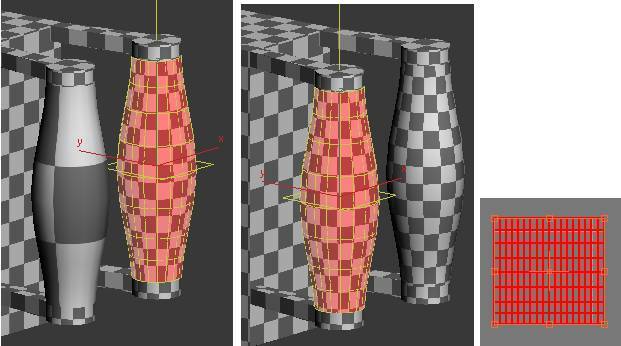 Overlap each set of meshes, and scale them to proper size. Select the right handle poly’s below. 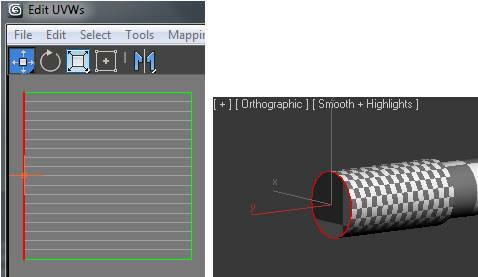 Go to Cylindrical mapping on the Z axis. Move the mesh outside the box and scale it. Do the same for the left handle. Then overlap the two meshes. The checkered box is now empty. All the gun surface areas are outside the checkered box. All the surface areas have been mapped and scaled evenly so the checkers are all about the same size. 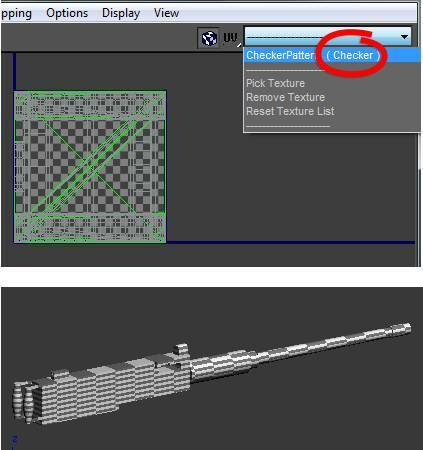 In order to export to a bitmap, we have to select all the UV mapped parts and Scale them down so the barrel segments fit inside the checkered box. Use the Move, Rotate, Mirror Horizontal/Vertical tools to place the pieces where you want them to be. Since we going to export a 1024×1024 bitmap, we will have a lot of texture space. 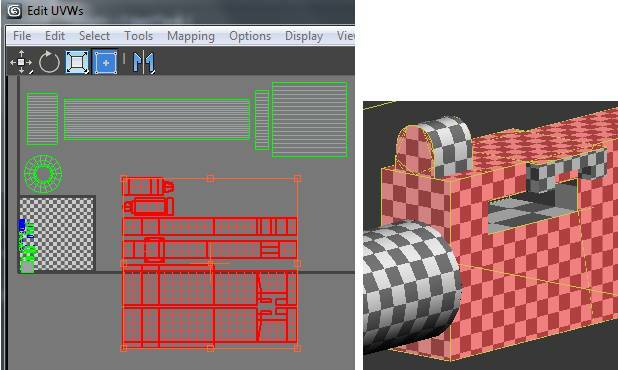 So some pieces like the gun box meshes can be scaled up. The gun box will have more detail such as indents and rivets. So scaling it up will give more texture space to those details. Some mesh pieces you will overlap. Some are already overlapping, and you will want to separate them. 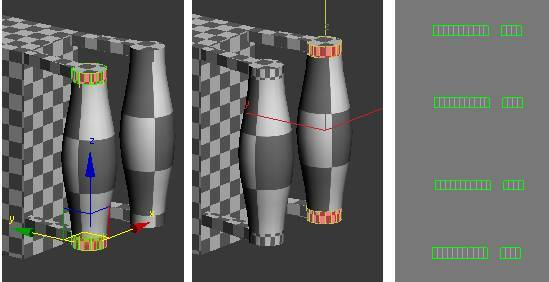 Separate the barrels rim meshes. They are all overlapping, and we want these pieces to have their own texture space. 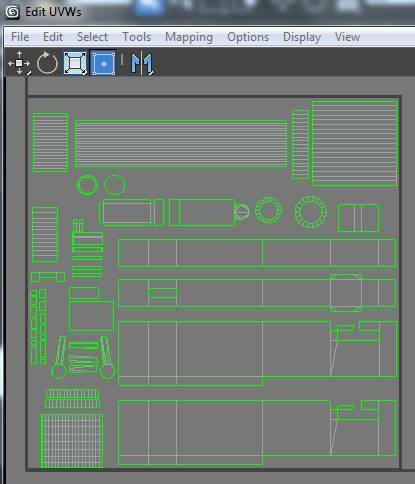 The final parts layout will look something like below. As you build the Normal, Diffuse, and Specular maps in a paint program, you will find that some parts need extra texture space. So you Scale up the parts that need more pixel space if there is room, such as the gun box pieces. 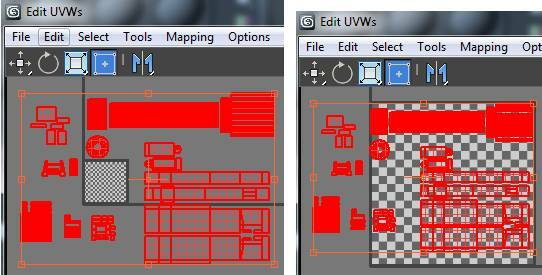 In the Edit UVWs window, go to Tools/Render UVW Template. Turn off Seam Edges and turn off Show Overlap. Width/Height = 1024. 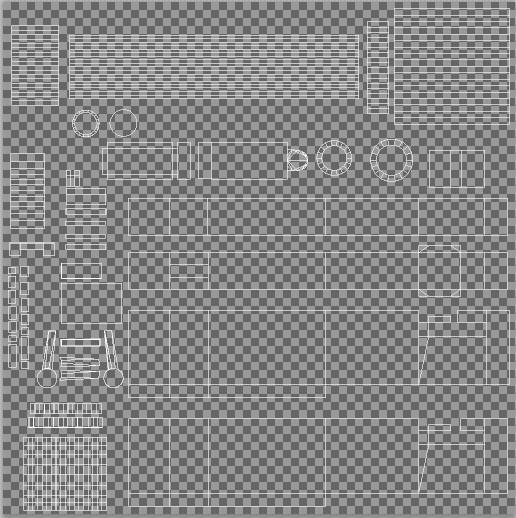 Click Render UV Template. Then Save As a PNG file. 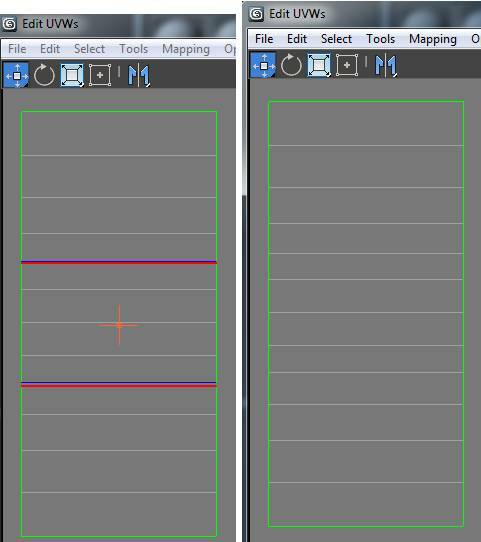 Open the file in a paint program, and you have a transparent Template for building your textures. Build a Normal Map using the Template above.